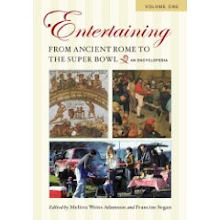 My cousin Patti’s husband, Paul Crosby is a Renaissance Man and a culinary DIYer. He makes honey straight from the hive, taught himself the art of blacksmithing, and has recently been lagering his own beer at their home in western Vermont. 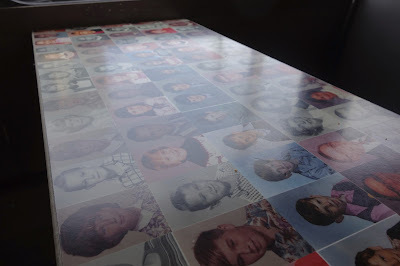 What I’ve learned about Paul is when he sees something in the environment around him, eventually he finds an innovative way way to bring it into the kitchen or home. 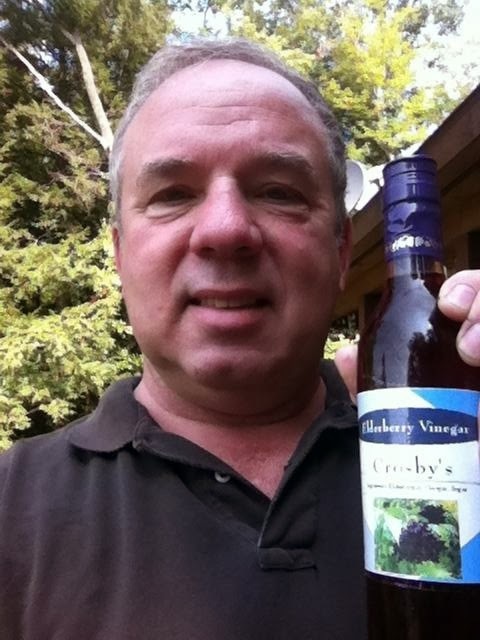 His latest creation, plucked from nature, is Crosby’s Elderberry Vinegar. Paul says it takes up to three years to get good berries on the bush and he starts new plants by rooting each year. The deep purple or blue elderberries are high in vitamin C, phosphorus and potassium and have medicinal benefits, including cold and flu prevention. Paul describes the flavor as “sweet, fruity and tangy.” He uses the berries to make syrups, jelly and also dehydrates the berries. The inspiration for Crosby’s Elderberry Vinegar began with a bumper crop of berries. According to Paul, the recipe just takes a little patience. 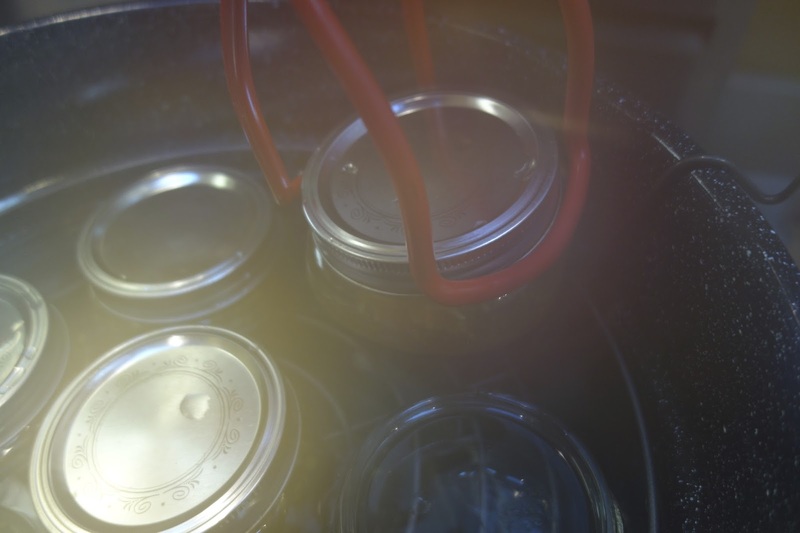 “I take three cups of ripe berries and seep them in a gallon of white vinegar for a week,” he explains. 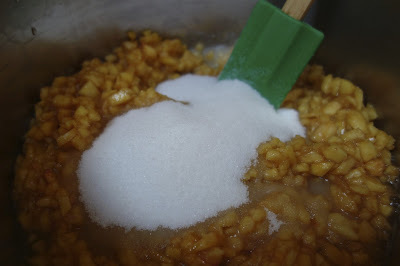 He then strains the vinegar, adds sugar, and brings it to a boil on the stove for 20 minutes. Paul thinks Crosby’s Elderberry Vinegar hits that sweet spot of a healthful and uniquely culinary ingredient. I have a great time experimenting with Crosby’s Elderberry Vinegar in the kitchen and use it three ways to prepare a salad of chicken and local greens and vegetables from Restoration Farm. 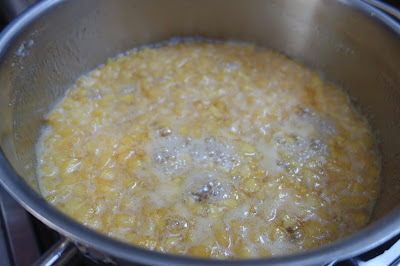 First, I marinate the chicken breast in a combination of one part vinegar and three parts olive oil. 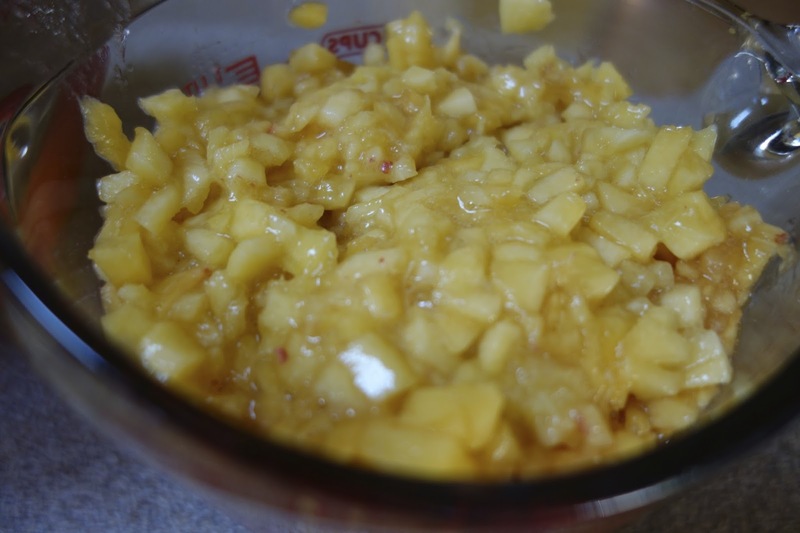 I use additional marinade for basting. 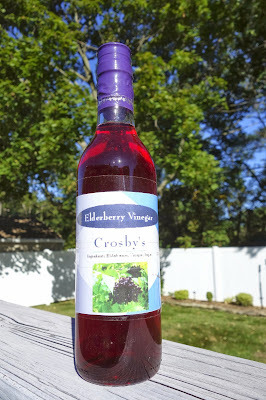 The greens are dressed in vinaigrette using Crosby’s Elderberry Vinegar. Finally, I drizzle the sliced chicken breasts with an elderberry vinegar reduction. 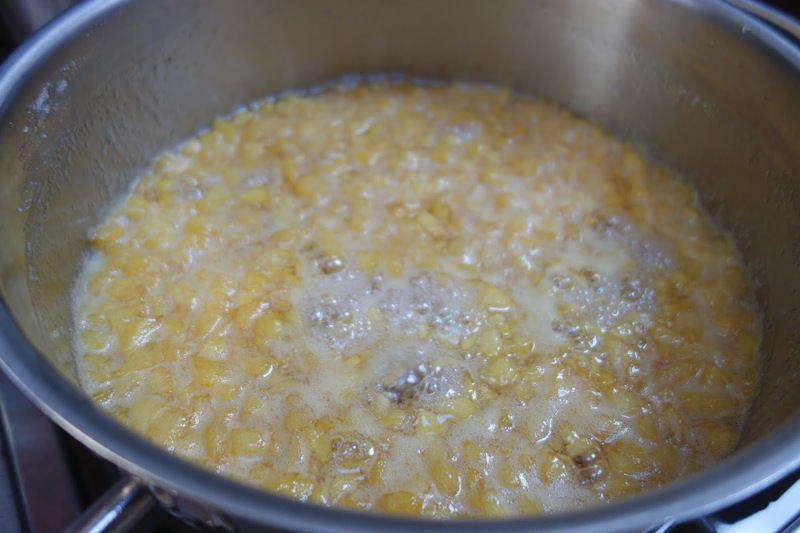 I boil about a quarter cup on the stove until it is reduced to the consistency of honey. 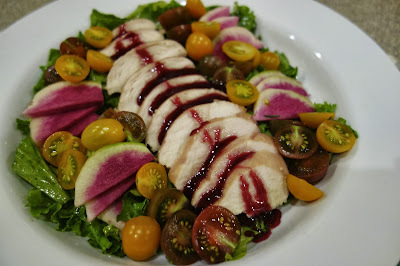 The jammy-purple color of the reduction provides a nice contrast to the chicken and the deep colors of the radishes and heirloom cherry tomatoes. 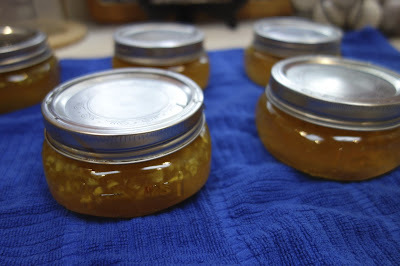 Paul is already tackling his next home grown culinary project – a specialty Vermont Acorn Vinegar with a nutty flavor he says goes well with wild game or makes a tasty dressing combined with Vermont Maple syrup. 1) Visit neighborhood farmers market early before it gets too hot; purchase best selection of ripe peaches. 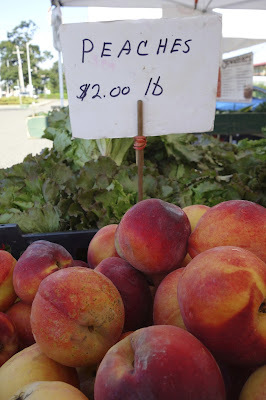 2) Admire and adore the color and texture of the peaches, even if we don't know exactly where they came from, and farmer is kind of vague about their origin. Contemplate how their lovely blush color seems so iridescent in the sunlight. 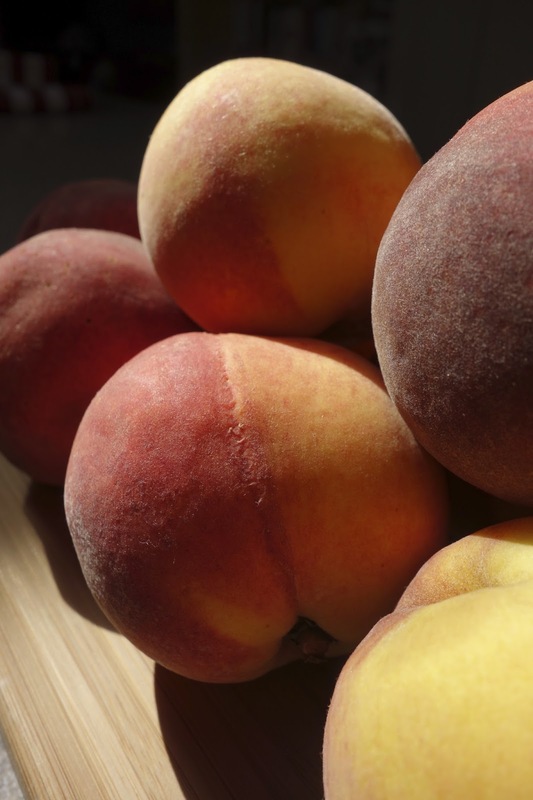 3) Resolve to hang on to that peachy summer goodness as long as possible. 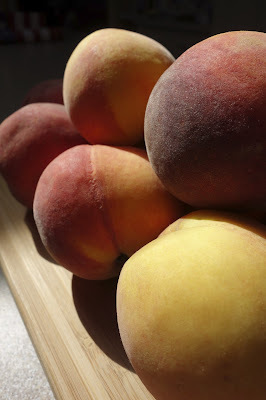 4) Peal and chop peaches fine and add lemon juice and a ton of sugar. 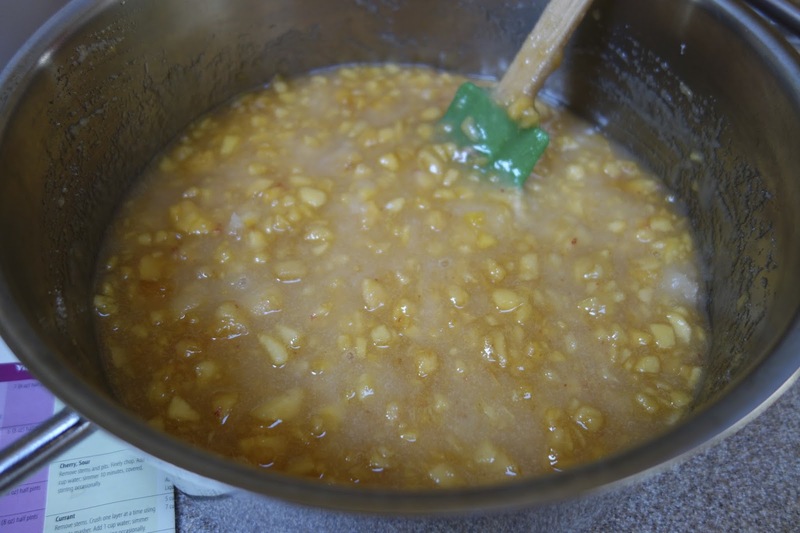 5) Simmer mixture on stove until it looks a bit like corn chowder. 6) Add liquid pectin and raise heat until mixture turns amber gold, and is the viscosity of warm honey. Inhale and appreciate how entire kitchen smells like warm peach pie. 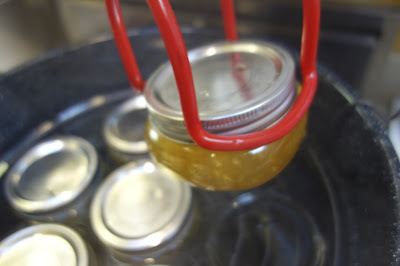 7) Affirm that personal canning skills remain in tip top shape. Fill rustic mason jars with hot peach syrup and process in a boiling water canning bath. 8) Listen for popping sound to assure that vacuum seal has been achieved. 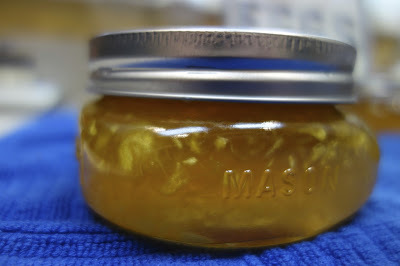 9) Cut a thick slice of artisan bread and slather with gooey, golden peach jam. Marvel at fact that summer flavors and memories can be savored well into the winter months. What's more comforting than a grilled cheese sandwich made by Mom? 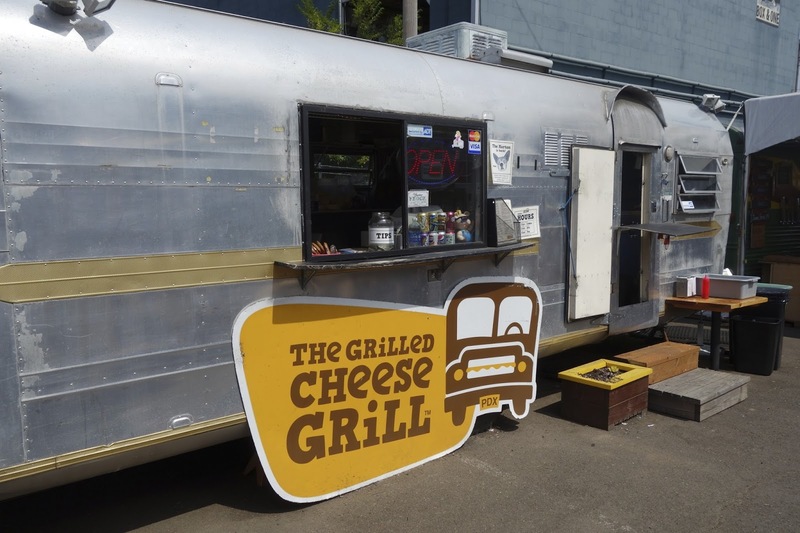 Believe it or not, the answer might just be a hot and gooey grilled cheese sandwich cooked up by a couple of bearded dudes in a gleaming silver trailer in Portland, Oregon. We'd heard that The Grilled Cheese Grill featured the best grilled cheese in Portland (who could doubt Reader's Digest?) 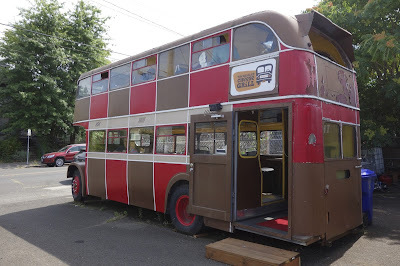 - but how cool to learn that it's all served from a truck, at one of Portland's numerous food cart pods -- this one located at SE 28th and Ankeny. It's hard to decide which is more enticing - the sleek, torpedo-shaped trailer that houses the grill, or the double-decker Partridge Family style school bus that serves as the dining facility. The youngest in our party insists that the bus is THE place to dine, and climbs to the top floor several times. The tabletops are covered in easy-to-clean decoupage featuring dozens of elementary school class pictures. 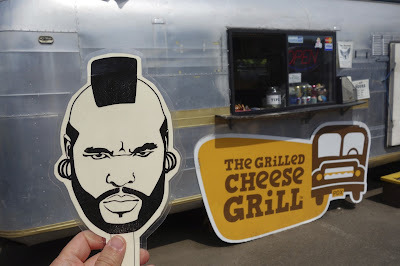 Step up to the grill window and place an order. You'll be greeted with a smile, and handed a claim check featuring the face of a 1980's TV icon. Appropriately, mine was Mr. T of the A Team. 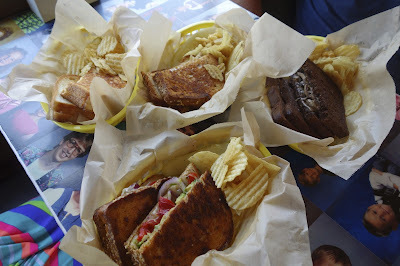 Our order is as varied as our party, and one can experience everything from classic grilled cheese to nouveau cuisine. 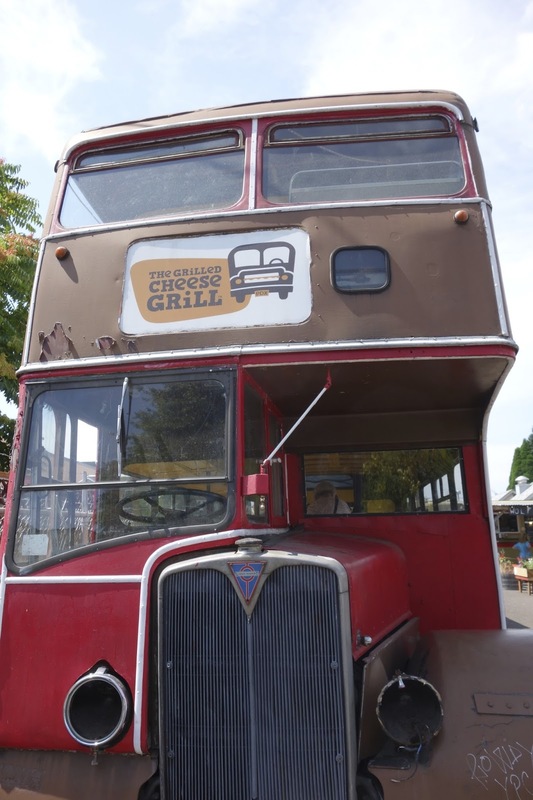 The Gabby features four cheeses – Tillamook Cheddar, Swiss, Mozzarella and Colby Jack. 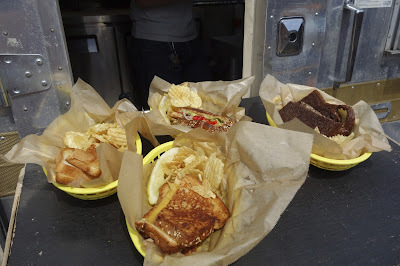 The Jersey offers sautéed mushrooms and Swiss on marble rye. The Mondor layers Pepperjack Cheese, avocado, fresh red onion and roasted red pepper. 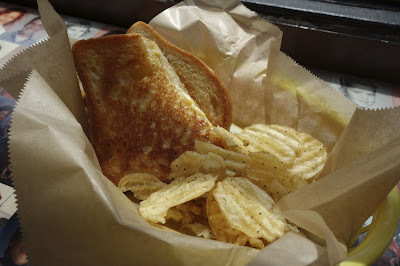 The Kindergartner (appropriately chosen by our Kindergartner-to-be) is classic grilled cheese on white or multi-grain topped with the regions best - Tillamook Cheddar Cheese. You can opt to have the crusts cut off. 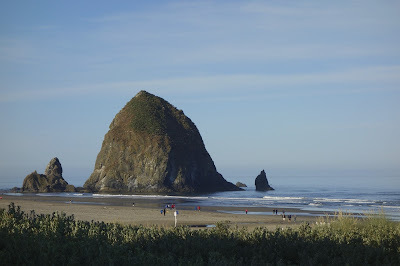 And there are plenty of other options that will have you reliving your misspent youth. A few bites, and we're all luxuriating in a luscious lactose high. The recipe is simple - just butter, bread and cheese. But, what stringy, delicious satisfaction! If you're ever in Portland, take some time to savor a scrumptious, second childhood courtesy of the Grilled Cheese Grill. Mike Selberg earned degrees in biology and chemistry. 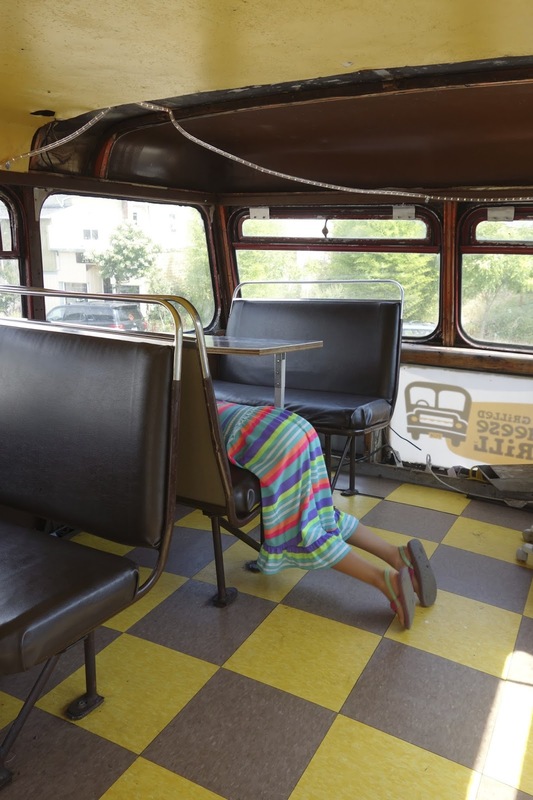 So what to do for a career? Open a distillery, of course. "It seemed the most fun way to make use of the degrees," says Selberg. 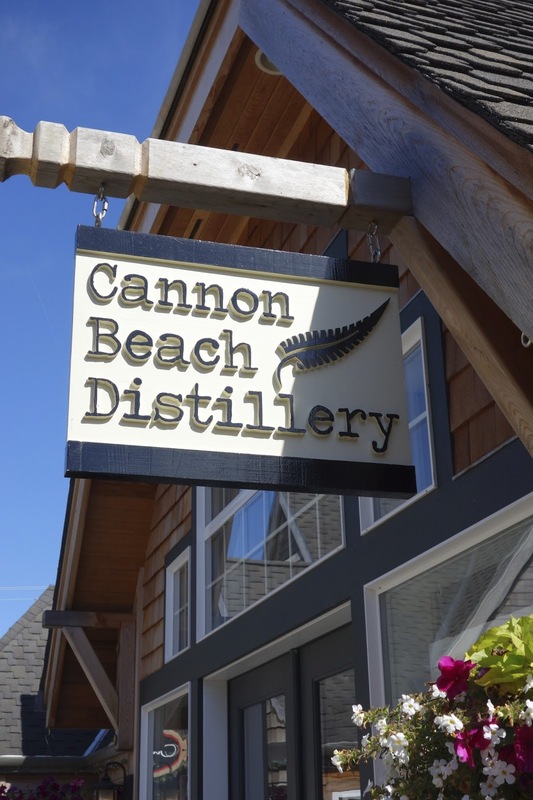 The Cannon Beach, Oregon resident opened The Cannon Beach Distillery just over a year ago at the west coast seaside town where he's lived since the age of six. The hand-made, small-batch spirits Selberg offers are infused with his scientific know-how and the spirit of adventure and exploration that defines the majestic Oregon coast. Selberg got his first taste of distilling in Chemistry class at age 19. After that, he started brewing beer, which provided experience in fermentation and a foundation for developing future spirits. 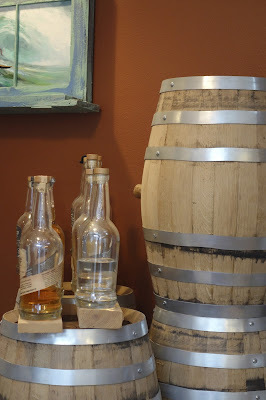 "If you can make a good beer, you can make a good whiskey," says Selberg. 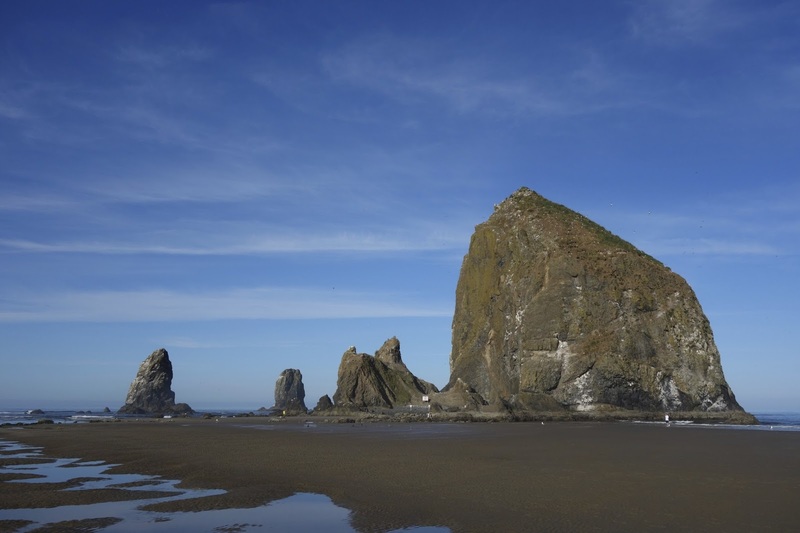 In 1846, a Navy schooner sank in the area, reportedly carrying three cannons. One was said to have been recovered and the area was thereafter named Cannon Beach. 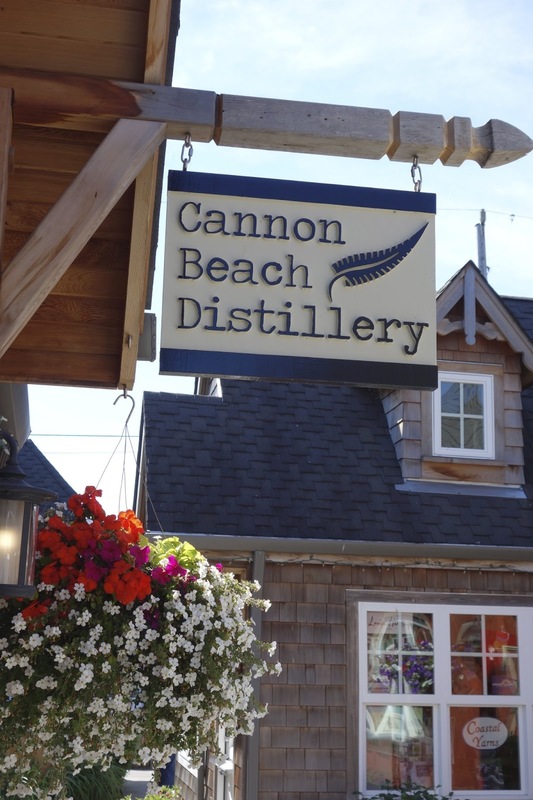 Mike Selberg's Cannon Beach Distillery is tucked into a secluded cul-de-sac at the north end of town. 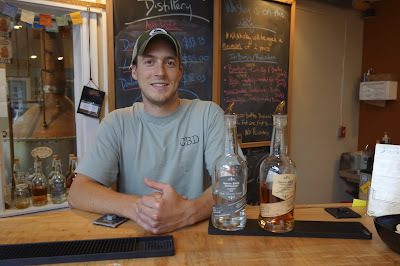 He's exploring many different styles of spirits with his own twist. 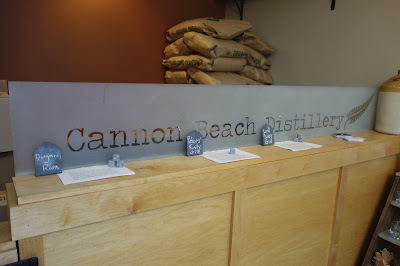 The distillery is decorated in rich earth tones, sandy wood and smoked glass and evokes imagery of rugged shorelines and burnished beach glass. 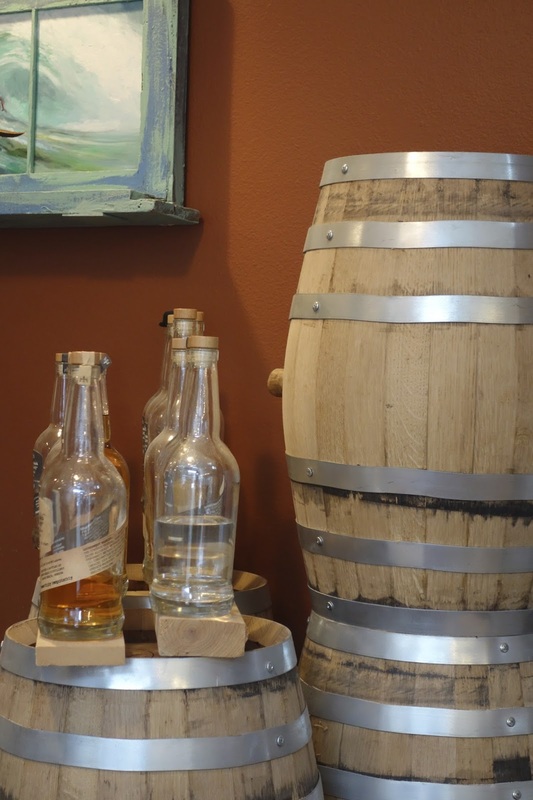 On a rainy summer afternoon, Selberg is sampling two styles of rum he's created. Dorymen's Rum is an evaporated cane juice based rum that is glassy clear and light in taste. Selberg says it's ideal for a refreshing rum cocktail like a mojito. Dorymen's is smooth and sweet and tastes like a lively sea shanty on the tongue. 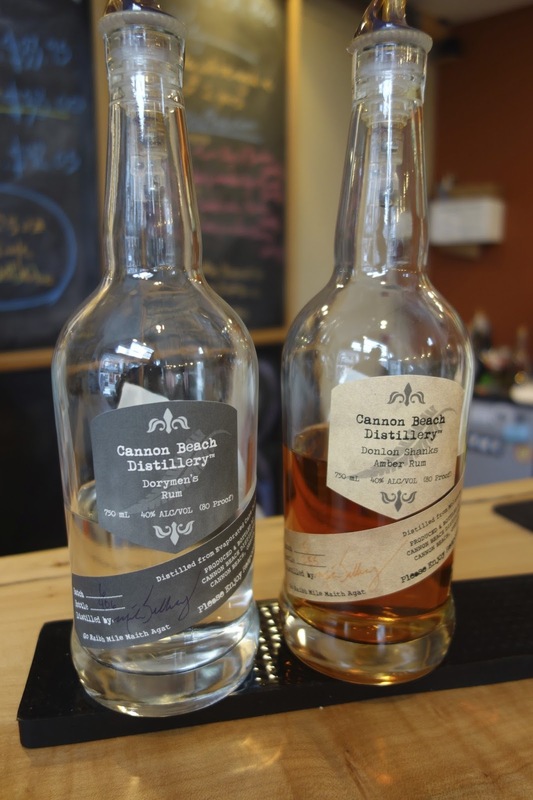 Dolon Shanks Amber Rum is caramel color and aged in heavily charred American white oak barrels. The buttery, smoky, rum is named after the two streets Selberg grew up between. Selberg uses blackstrap molasses, and the sampling we try has the character of an aged whisky that can be sipped slowly and enjoyed. The amber rum is his most popular spirit. 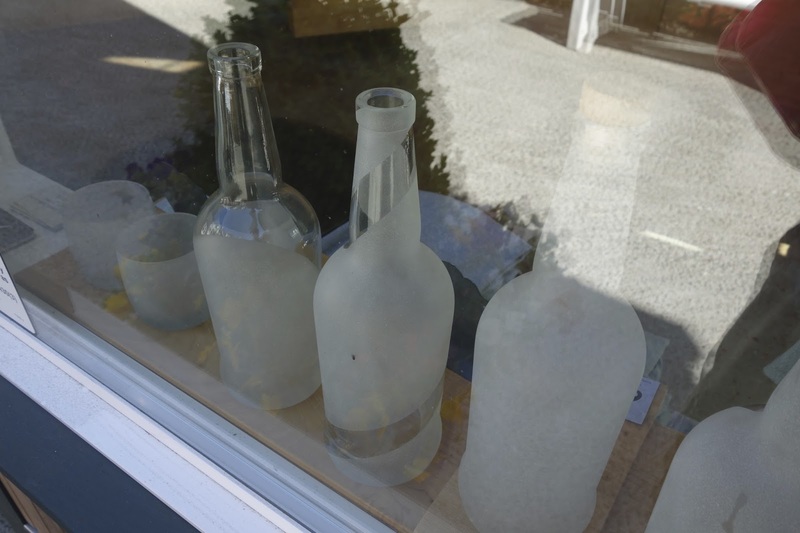 Selberg offers two styles of gin -- Peter's Family Gin and Lost Buoy Gin. He's also got several spirits in production. 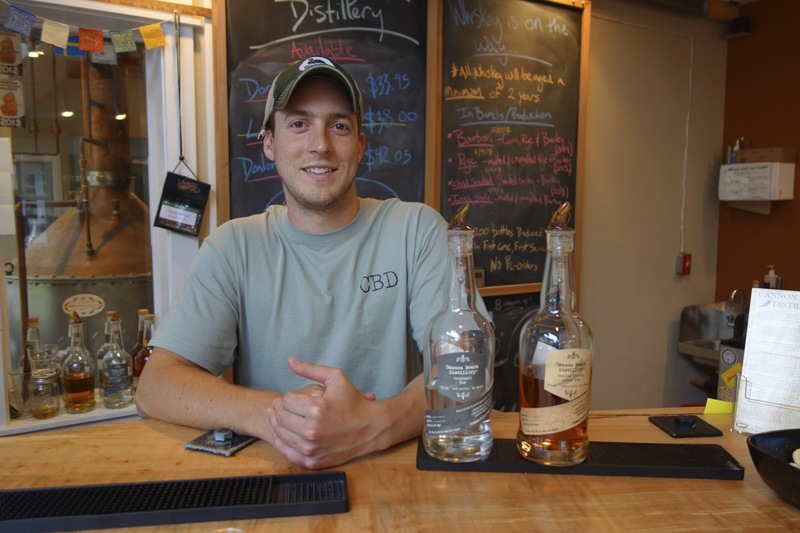 His bourbon -- made of corn, rye and barley -- will be ready for sale in 2014, and a rye -- made of malted and unmalted rye and barley -- will come of age in 2015. As a new entrepreneur, Selberg works long hours. 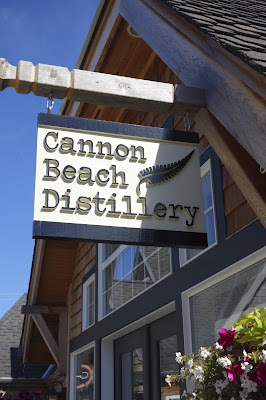 He's typically at work in the distillery for five or six hours in the morning before the tasting room opens in the afternoon, and he usually logs a 12 to 13 hour day. Selberg says if he makes a hire in the future, he will bring someone on to staff the tasting room, so he can focus on his work in the distillery, leaving the scientist more time to come up with his next discovery.